Artist's illustration of NASA's InSight lander cruising toward Mars. 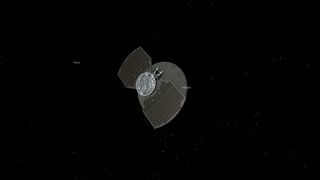 InSight, which launched May 5, performed its first course-correction maneuver on Tuesday (May 22). NASA's InSight Mars lander performed its first engine burn on Tuesday (May 22), refining its course toward the Red Planet. The 40-second burn, which involved four of InSight's eight thrusters, was designed to change the lander's velocity by about 8.5 mph (13.7 km/h). Mission team members will perform up to five additional burns before InSight's Nov. 26 touchdown, but none will be more substantial than Tuesday's, NASA officials said. "As a result, Mars launches involve aiming the rocket just off-target so that it flies off into space," NASA officials explained in a statement announcing InSight's engine burn. "Separately, the spacecraft performs a series of trajectory correction maneuvers guiding it to the Red Planet. This makes sure that only the clean spacecraft lands on the planet, while the [rocket] upper stage does not come close." The four thrusters not involved in Tuesday's maneuver have been getting a workout, too. They fire autonomously every day to keep InSight's antenna facing Earth and its solar panels facing the sun, NASA officials said. InSight's navigation team tracks these background burns closely. "Everyone has been working hard since launch to assess what these small forces have done to the trajectory," InSight navigation team chief Allen Halsell, of NASA's Jet Propulsion Laboratory in Pasadena, California, said in the same statement. "People have worked lots of hours to look at that. For engineers, it's a very interesting problem, and fun to try to figure out." InSight — whose name is short for "Interior Exploration using Seismic Investigations, Geodesy and Heat Transport" — is headed for a flat plain just north of the Martian equator, where it will make a parachute-aided touchdown on Nov. 26. The lander will then spend about two Earth years monitoring "marsquakes" and subsurface heat flow, gathering data that should reveal a great deal about the Red Planet's interior structure. InSight's observations will help scientists better understand how Mars, and rocky planets in general, form and evolve, mission team members have said. InSight shared a launch with a demonstration mission called Mars Cube One (MarCO), which consists of two identical, briefcase-size satellites. The MarCO craft have already traveled deeper into space than any other cubesat ever has. Follow Mike Wall on Twitter& @michaeldwall and Google+. Follow us @Spacedotcom, Facebook or Google+. Originally published on Space.com.